Welcome to the TREVETHAN TREVATHAN family history site. Sorry none left after third reprint - December 2012 but now available as an ebook costing $20. Please email me if you want one. What a remarkable book …. If you are a Trevethan or Trevathan relative then this is a book you must read. This history of the ancient Cornish family is fascinating being a collection of research which has taken the best part of a lifetime to put together, It is finally now available for you to enjoy. 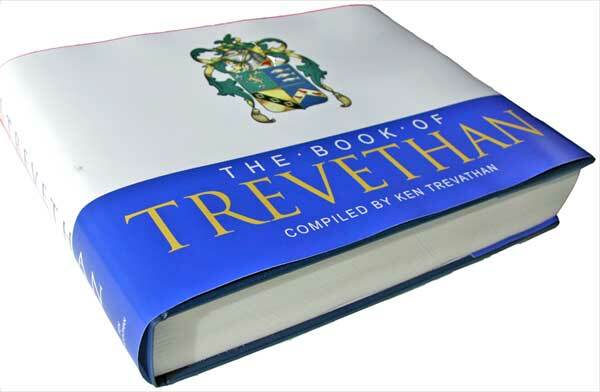 A beautifully crafted book of 538 pages which has been case bound for durability with a hard cover finished in blue linen with a full colour dust cover showing the Trevethan coat of arms. The inside is printed on high quality 100gms cream paper which in harness the 362 mainly very old black and white photos, maps and drawings colleted from all over the world. Also inside are beautiful full colour drawings of a number of Trevethan coats of arms dating back to 1573. Detailed family trees for not only the family in Cornwall but also for the families from the United States, Canada, Australia and New Zealand. Read about the Trevethan secret tunnel at Porthcothan in Cornwall. Find out what a voyage on an immigrant ship was like. Read about the first car manufacture in Australia. Visit the villages and houses the family lived in all those years ago and trace your relations back to around 1300. Find out about Jonathan Trevethans run in with highway robbers near London. Find out about smuggling and the capture of two Norman fishing boats in 1545 and their recapture by Thomas Trevethan. And then there are the riots that resulted from the price of meat being increased by twopence a pound on the goldfields of Australia by butcher Adolphus Trevethan. While on the way into the court case that followed he would have been killed, but he drew his revolver and fired point-blank into the crowd. Only a very limited number of these books have been printed and is the last book I will be publishing. Be in early if you would like to own a copy. These books are being offered to the family at cost as it is not my intension to make a profit. This is the history of the ancient Cornish family now spread the world over. No matter where you live in the world if you are interested in the Trevethan or Trevathan family this site has a host of information for you. For New Zealanders it gives the history's for the descendants of the family of Thomas, Emma, David, Maria, and Polly Trevethan. This family of five young people came to New Zealand last century and now we have more than one thousand descendants from these brothers and sisters. Included is information about the first wife of David Trevethan, the first wife of Thomas Trevethan and his daughter from that marriage, Elizabeth Trevethan. Living in the Auckland area of New Zealand at the present time is a family by the name of Trevarthen and a little of their early history is also included. I have been researching this family for more than forty years and, as with all family histories, the research is never finished. The first edition of my book was produced for the benefit of close members of my own family as a Christmas present, but the demand for this book has come from near and far. This keen interest prompted me to produce a second edition, followed by a third, fourth and fifth. More than two hundred and fifty books have found their way to the four corners of the world. Some to Australia, England and even the United States of America. This internet site contains a lot of extra information, extra family trees, many new photos, but most of all it includes a large new section on the very early days of our family in Cornwall. As you read this section you will be able to visualize what the early days in Cornwall were like and visit the villages and houses the early Trevethan’s lived in. Much of this information, photos and interesting maps were provided by two professional researchers in Cornwall, Bernadette Fallon and Mark Johnson. I was fortunate in August of 1990 and July of 1994 to be able to personally visit this most interesting area of Cornwall, and in two short weeks collected a lot of further information. It is still as important today as it was when I produced my first book, to commit this information to paper so as to ensure the facts are kept for prosterity. Also new to this site is the section on the origination of the Trevathan name and some very interesting information on two Trevethan coats of arms which belong to our family, plus some others used by families with names spelt similar to ours. Read also about the voyage from England to New Zealand. Find out about the Trevathan family in America, Canada and Australia. When I first wrote my book DNA was unknown but now this modern tool has found a place in family research. Recent tests show that as a result of testing my own DNA that my Trevathan line is complete back to Cornwall and then down to one line of the American family of Trevethan. Bernard Trevethan of America and I are 5th cousins. The test however also showed that I am not related to the main American Trevathan line which was quite a surprise. Although I have been very careful to ensure that there are no errors in the family trees many of the entries are from the memories of members of the families. If when reading this site you find any errors or missing facts please contact me at kentrevathan@clear.net.nz so that corrections may be made. Although a great number of relations have contributed to the information on this site, a very special thanks needs to go to the late Mary Kitto from Tarras, Otago, New Zealand who had collected from near and far a good many of the photos added to the second and fourth editions of my book. A further collection of photos from a collection belonging to the late Flo Betts of Dunedin, New Zealand fell into my hands a few years ago and many are included on this site. Many of the photos of Cornwall were taken by me on my visit in August 1990. Mrs. Conney Periam from Cromwell, Otago has also provided a lot of local history and put me in touch with a number of other people who were able to add small parts to this now complete site. I am also indebted to Mrs. Donna Bettis, Mrs. Ruth Delvige and Mr. Bill Utley from the United States of America and Mr Laurie Turtle from Australia for providing information on their lines of the family. So sit back and enjoy reading this history and remember if you have any old photos or further information on your family I would be grateful to receive it.